95 pts. It’s a world class wine offering that strikes a brilliant balance between lush fruit and crisp, mouth-watering acidity. This show-stopping white displays effusive aromas of white flower, stone fruit, honey and toast which erupt into opulent flavours of pear, orange blossom, caramel, and spice. It’s a world-class wine offering that strikes a brilliant balance between lush fruit and crisp, mouth-watering acidity. The grapes were picked in three different passes in order to achieve optimum ripeness and balance in the final wine. The grapes were handpicked in the early morning hours, with bunch selection done in the vineyard. The fruit was cooled down and then gently pressed, the whole bunch, and the juice was settled overnight without the use of settling enzymes. Fermentation occurred naturally in French oak barrels (20% new), using indigenous yeasts, with about 20% of the volume completing malolactic fermentation. The wine was aged on its lees in barrel for 10 months, without batonage. 2017 was another hot and dry vintage in the Cape. Although the daytime temperatures were warm, evening temperatures were much cooler than normal resulting in wines with incredible weight and texture, yet with great acidity and length. The dryness of the season resulted in minimal disease pressure with fruit arriving at the winery in very good condition. The grapes were handpicked and selected in the early morning at between 22.5º and 23.5º Balling. 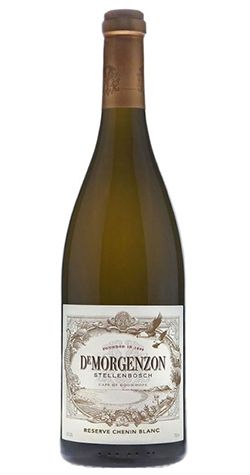 DeMorgenzon, ‘the morning sun,’ was so named as it is the first part of the Stellenboschkloof valley to see the sun because of its high altitude and aspects. We cover the top southern and eastern slopes of Ribbokkop, overlooking the pinnacle of Kanonkop from where a cannon was fired to alert the farms in the region that a ship had put into Table Bay. The first road from Cape Town to Stellenbosch ran through the Stellenbosch Kloof. In 2003 Wendy and Hylton Appelbaum bought DeMorgenzon and have since transformed DeMorgenzon into a 224-acre garden vineyard, where abundant wildflowers grow between the vines.